In the next instalment of International Student Data Patterns, our Skills for the Future Trainee Cat Doyle takes us through a diagram she produced which gives an insight into student numbers from particular countries between 1903 and 1949. 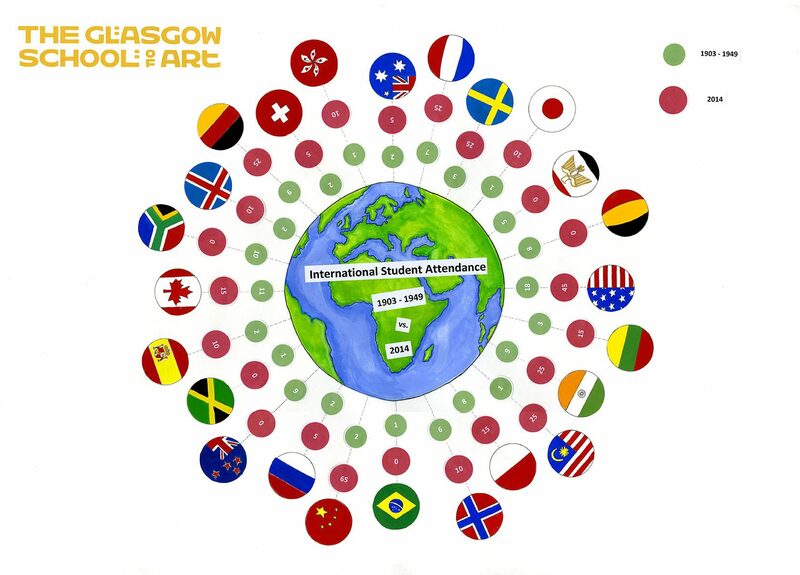 The green circles on the diagram show the total number of students coming from each country in the 46 year period examined. These are contrasted with the red circles which show the total number of students from each country in 2014 alone. Amazingly, this is still only a small proportion of 2014’s international students which came from approximately 45 different countries. Although we would expect total number of International Students to rise on the whole, a number of unexpected things came from the data visualisations. One hypothesis might be that GSA would still attract students from Belgium, however no Belgians attended between 2008 and 2014. This leads us to wonder whether artists from Belgium aren’t attracted to GSA because they have such well-established Schools as the Académie Royale des Beaux-Arts De Brussels which produced some of GSA’s finest teaching staff in the 1900s (you can read more about this in The Belgian Big Three). 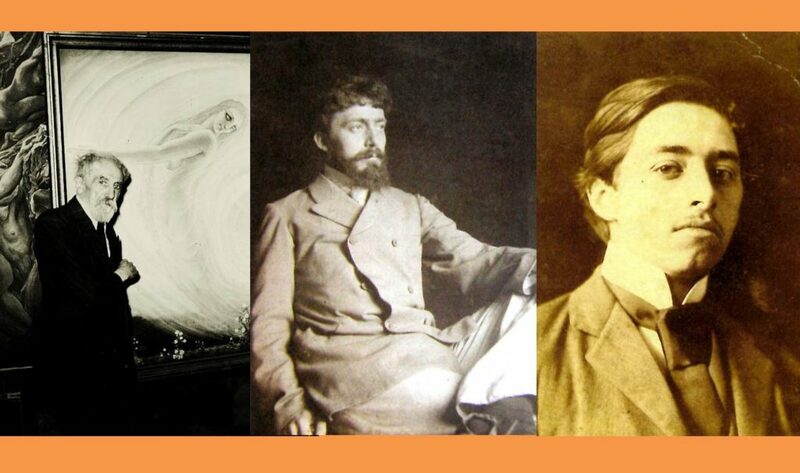 Belgian Symbolist Artists Jean Delville, Paul Artôt, and Georges Baltus who all taught at GSA during the 1900s. Image of Delville courtesy of Cultured. Images of Artôt and Baltus courtesy of The Flower and the Green Leaf, p.63 and 65. Another interesting comparison is the fact that the School attracted a relatively significant number of students from both Egypt and South Africa between 1903 and 1949 and yet none at all appear between 2008 and 2015. It is interesting to consider whether this is due to the fact that by 1950, both countries were no longer governed under British rule as African countries gained independence. Names of individuals from each country can be found under the places section of our online catalogue. 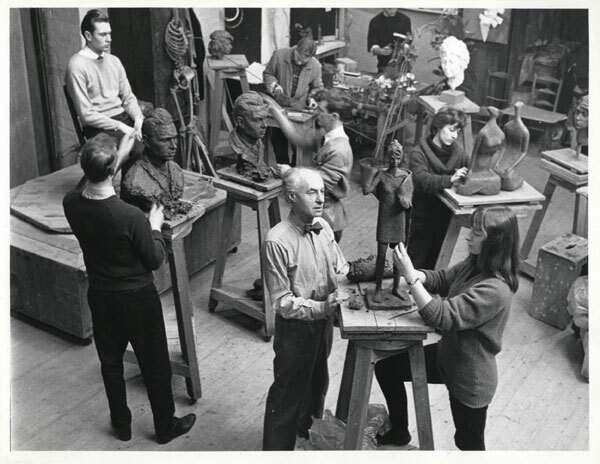 They include rather notable names such as the Estonian sculptor Benno Schotz who attended the school from 1914 and became head of the Ceramics and Sculpture department in 1938. Please leave a comment if you would like to share anything that you find interesting about the International Student Patterns revealed by the diagram! The data used for the handmade poster in the International Links project was collected from student registers at the Glasgow School of Art Archives and Collections and information from GSA published data on the British Council’s Services for International Education Marketing. The information on the latter is rounded to the nearest five for data protection purposes as it represents the year 2014. All information represented shows all students from outside the UK and Ireland countries of domicile.